The Speciality Coffee Movement in Stockholm. Sweden is one of the largest coffee consumers in the world, yet finding a good coffee in the sea of Stockholm cafes and lunch bars is more often than not a difficult task. Despite the strong tradition of coffee drinking, most Swedes are accustomed to a rather ordinary cup when compared to international standards. But from this cultural pillar, a speciality coffee movement is emerging in Stockholm – a close-knit community that is keen to spread the word and change coffee habits in the capital forever. It’s a far cry from the regulars at Mariatorget. Already spoiled for choice by the proximity of Drop Coffee and speciality coffee concept store Johan & Nyström, there is a tendency for customers to be less sceptical and inquisitive when they are already used to requesting a fresh roast of East African beans, specifically from the Gatsinga farm in Rwanda, on their way to the T-Bana. It is the role of the baristas and those involved in the specialty coffee community to raise awareness and educate Stockholmers, who are well accustomed to taking coffee for granted. “You still have to know where to go in Stockholm to get a good coffee,” attests Charles Taneesan at Kafé Esaias – and it’s something the specialty coffee community is trying to turn around. “We must be good at what we do to prove ourselves,” adds Morin. It is this genuine passion that is most striking when entering the select coffee bars of Stockholm – being a barista here is not treated lightly. Far from being a waiter who refills the coffee jug on the side – these baristas are well-informed professionals – they are more than happy to take the time to chat with new customers, gently explaining the elements of their trade and the wide variety of nuances in taste. “A barista is not just making coffee, it’s getting to know everything – how you can improve it, it’s seeing coffee as an art,” said Jelle Van Echelpoel at Kaffeverket, Snickarbacken 7. Morén continues, “I have customers who come in and say, ‘I want the darkest coffee you have’… how do you respond to that? All we can do is give options”. 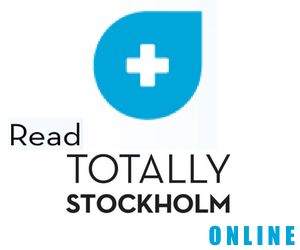 “Most Swedes drink the generic coffee, you add milk and sugar to mask the bitter and burnt taste – if you had high quality, well extracted, finely roasted beans then milk and sugar would not be necessary,” Wredlert continues. The knowledge base applies equally to the coffee bean farmers. Ingvarsson explains, “a lot of coffee farmers are raised by tradition rather than skill, at Johan & Nyström we prefer to work with farmers of sophisticated knowledge – some even have PhD degrees in agronomy.” The specialty coffee market is indeed taken very seriously. The origin of the coffee bean is paramount. Speciality coffee bars are buying from independent coffee importers and roasting them themselves on the premises. 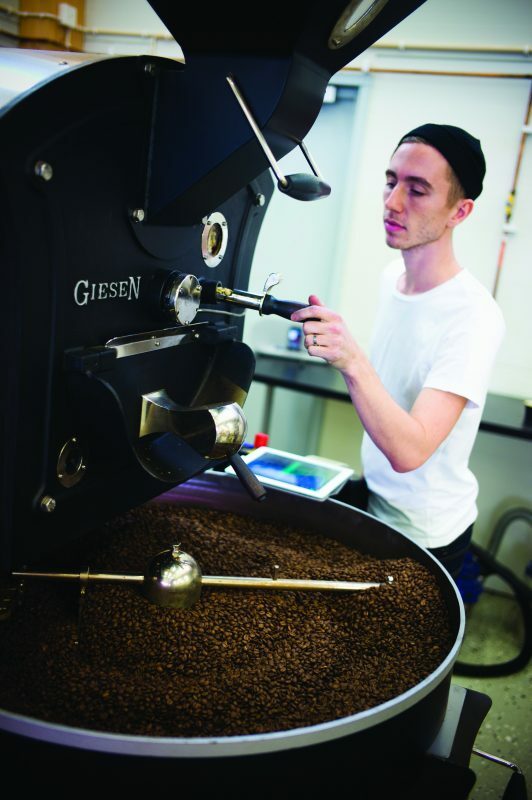 If they don’t roast on-site, the speciality coffee bars work closely with roasters such as De Matteo of Gothenburg or new boutique roaster David Haugaard who works just south of Stockholm. “If you don’t know what’s in the cup you can’t adjust it to get the most out of the bean,” said Wredlert at Esaias. Haugaard travels personally to Africa and South America to source his beans; it is the genuine relationship between the farmer, the roaster and the barista that ensures ultimate transparency when it comes to guaranteeing quality. A little shop front just around the corner from Mariatorget, Drop Coffee is the hidden secret of the specialty coffee scene. The brew bar sits at the front of the café, the onsite roaster is out the back. They use porcelain filters made in Japan and the owners travel personally to far off places like Columbia and Ethiopia to source coffee beans and buy direct from farms. Sitting bar-side and watching the water being poured – the shape of the filter drawing the refined taste from the interspersed whirlpool – as your coffee drains down to the cup below is a delight. They offer instructional classes too. A smart lunch spot on upper Drottninggatan, it is a welcome relief from the wash of chains and tourist dives further down the street. Co-owner Joel Wredlert comes from a kitchen and service background so hospitality is of the utmost importance. However that is not to suggest their coffee is any less than one of the best cups in Stockholm. Recently cited by renowned New York Foodie Adam Goldberg as one of his best espressos of 2011, Kafé Esaias is receiving the attention it deserves. Furthermore, the latté art on show is of the highest standard, we were lucky enough to see “Bob the Goldfish” in our frothed milk. This concept store is established as an ‘environment of learning.’ Unlike any other café, Johan & Nyström hold frequent cupping and tasting displays. Here they use the Air Press filter on their brewing bar – the vacuum filter takes away the air particles which raises the consistency of the 19 grams of coffee, extracted for 60 seconds. It is a place to come when expecting a performance. The coffee is roasted by hand at their roasting sight in Tullinge, South Stockholm, where everything is done on two stainless machines from 1956, in a method called a Slow Roast. Approaching coffee making as a profession is taken most seriously here. Just down from S:t Eriksplan, Kura is run by two New Zealanders well educated in global coffee trends. From first coming to Sweden ten years ago and not being able to find the ingredients to make a curry, they are impressed Stockholm has since embraced international food trends, especially when it comes to coffee. The café has two grinders on site – combined with precise extraction on their LaMarzocco espresso machine, they make a coffee to be reckoned with. They source their beans from De Matteo who they are working with to create their own house blend. Latté Art showdown competitions are frequently held here – an exciting showcase of the skill and creativity of their baristas. They also serve an excellent lunch. Kaffeverket at Snickarbacken takes the notion of the ‘hole in the wall’ coffee spot to a new level. It is the Café-in-a-Cave. A deliciously surprising location (just around the corner from Östermalmstorg’s T-Bana), the coffee bar is combined with a spacious dining area and art space. Already established for providing a good lunch, they are trying to raise the already high profile of their coffee by bringing the brew bar into sight and holding more tasting sessions. Their coffee comes from Gothenburg micro-roaster De Matteo and their baristas are some of the most enthusiastic in town. Described by owner Ilias Ioannidis as “a hole in the wall with a big environment,” Cocovaja is a watering hole for regulars, serving some of the best soups in town to compliment their considerable selection of coffee on offer. Cocovaja uses coffee roasted by David Haugaard. The proximity of the south Stockholm roaster to the café ensures the freshness of the blend. They used to be a coffee shop that tried to change drinking habits, but now they’ve taken a different approach, “connoisseurs will find us,” says Ioannidis. The quiet confidence is warranted with their coffees often ranked the best in Stockholm.